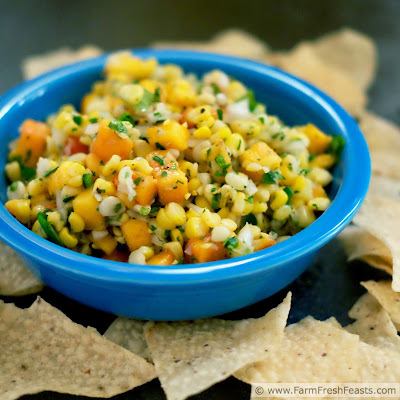 A fresh salsa perfect for summer snacking! Fresh corn and peaches tossed with spicy cilantro-lime mix uses the best of summer produce. Got your chips ready? We eat a lot of salsa around here. It's an after school snack for the kids, an "I just walked in the door from work and I'm STARVING" snack for my spouse, a bit of local food with many meals, and one of my most successful canning projects. 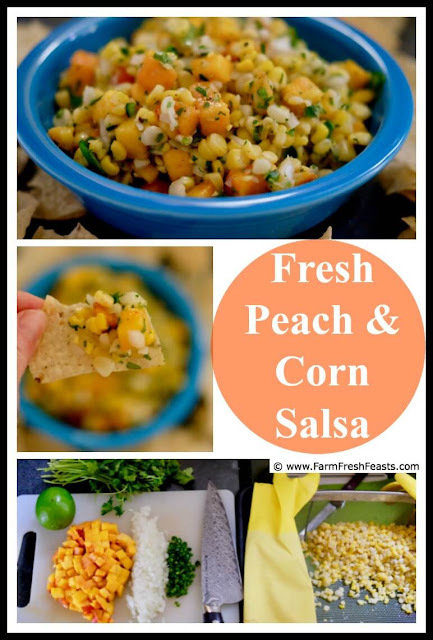 Even though I put up plenty of tomato-based salsas, Salsa Verde with Roasted Hatch Chiles, Peach Salsa with Golden Plums, and Roasted Corn and Hatch Chile Salsa, I'm still lured by the availability of fresh seasonal produce. When you've got a pile of ripe produce--gorge away, and then have at this salsa. The longest step, cooking the corn, can be done ahead of time. 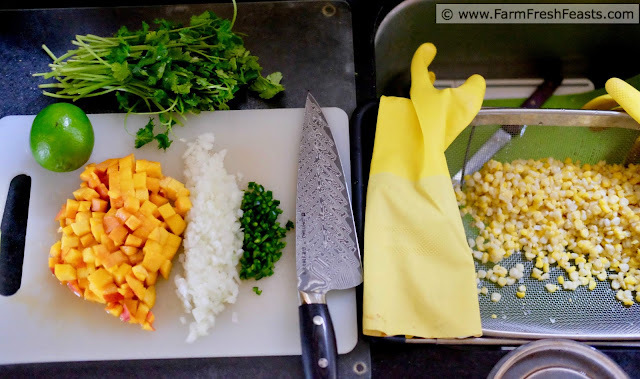 My eyes are always bigger than our bellies when I'm buying fresh ears of corn at the farmer's market, and corn is best when cooked soon after picking, so I always cook the whole batch at once and then use the cooked corn later. 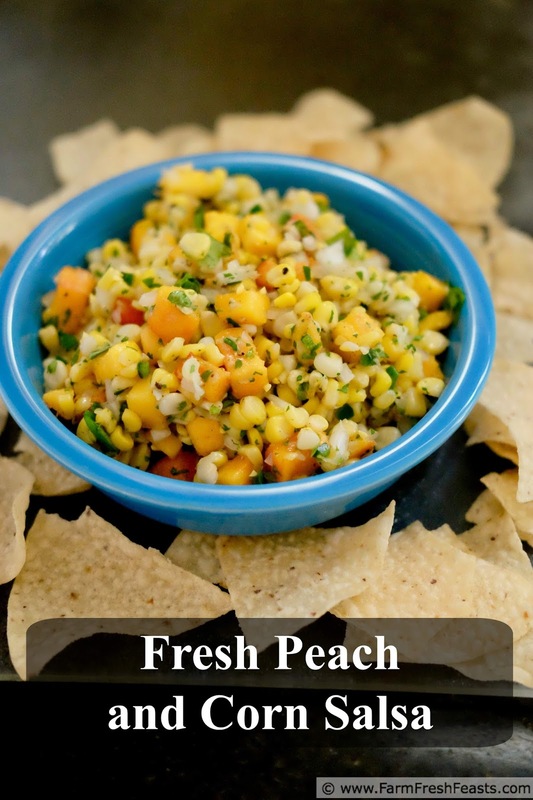 This peach and corn salsa is quick to make and easy to enjoy. May I suggest a Cheater Margarita Smoothie as the perfect summer sipper? 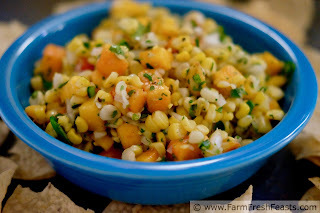 For more recipes using corn, please see my Recipes Using Corn Collection. For more recipes using peaches, please see my Peach Recipes Collection. For more recipes using peppers, please see my Pepper Recipes Collection. These collections are part of the Visual Recipe Index by Ingredient, a resource for folks like me eating from the farm share, the farmer's market, the garden, the neighbor's garden, and great deals on ugly produce at the grocery store. In a large bowl, combine all ingredients until well mixed. Let rest on counter 10 minutes until flavors have a chance to blend. Serve with chips, over fish, whatever tickles your fancy. This sounds equally as good as the cheater margarita. I will take two of each please.